Bup-baaaa... this is the sound of settling... Settling into our new place in Boston, and into this new space online (and as you can see above, Rudie has certainly made himself at home). So this is it guys. After a whole lot of thinking + plotting + planning, I've decided today is the day to launch YYZ -> BOS. As you may have noticed over the past week, I have been switching all my domain links, info, etc. to the new domain (http://www.yyztobos.com) across the interweb, and setting everything up over here design-wise. Just to be clear, If you decide to keep following along - this space will be similar to POLKA DOTTED PIXELS, but different. However, the change was mostly brought about because of domain issues (and the itch to start a new project). I promise the content will be even better :) Check out my ABOUT page for a little more info about me, and what you can expect to find here. YYZ -> BOS is ultimately a blog about my life/style/lifestyle. My life is not perfect (not even close), but it's mine. It's been a tough, awesome, scary, wonderful (and everything in between) kind of year for my little family. Looking back, we have embarked on some pretty amazing adventures, and this space is a way of chronicling them. Creating an archive so that I don't forget this time in our lives as it moves on and on. So here you will find me in search of balance (the constant struggle), a collection of pretty things, and making my home away from home. You know how sometimes you feel like your move is never going to end? Moving to another country is about 10000000x more stressful/complicated/insane (and had a lot of parts to it). When we were finally able to get into our new place, we welcomed crashing on the floor (and by the way, I'm kind of obsessed with our hardwood). I've had quite the time picking furniture + decor for our new space. 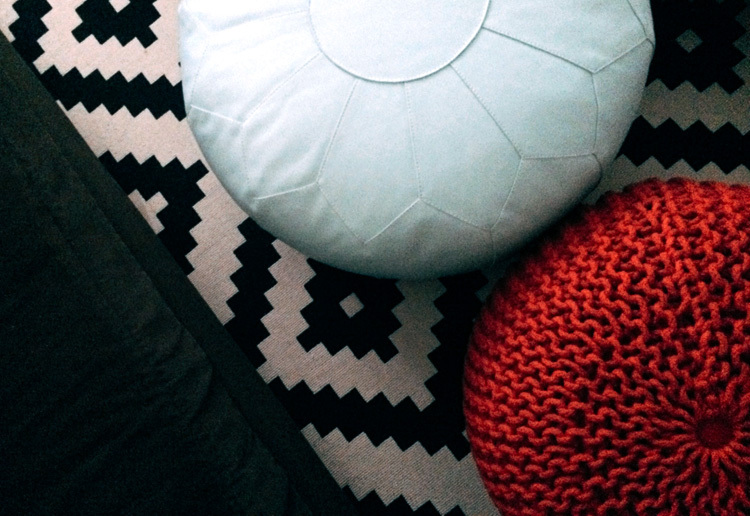 I had been fawning over these floor poufs (mint one from Land of Nod, and blood orange one from CB2), and they finally arrived last week. What a happy mail day that was! Breaking in our brand new wine glasses after a long day of unpacking (left), and our first meal (bacon + eggs + toast + americano) in our new kitchen, at our minty kitchen table (right) - yumm! And yes, if I have my way, our apartment will be a sea of mint and gold. Sketching little mock-ups of our place in a new journal. Trying to plan for wall shelves + frames + other decor (on the left). Night stand progress (though it has since changed)... Gettin' crafty with Rub N' Buff (that vase/can used to be bright red), and experimenting with the Wit N' Delight for Target Ceramic Diamond Tray (on the right). And lastly, my favourite piece (and the first thing we moved into our apartment), our Eames/Herman Miller Surfboard Table. This guy is truly amazing - it's about 8 ft long.. haha. But it works really well with our super long couch (the Movie Sofa from CB2, seen here in Salt + Pepper, but ours is in Espresso, a colour no longer available), which is also huge. Our little place is starting to feel settled, but it's not quite there yet. This week I'm going to tackle my desk/office + yoga/meditation space. I'm also making wall shelves + photo frames a priority this week. I don't know why, but I've got it in my head that our place won't feel like home until there are prints + photos on the walls.